John Young has to be one of the most underated men in rock. 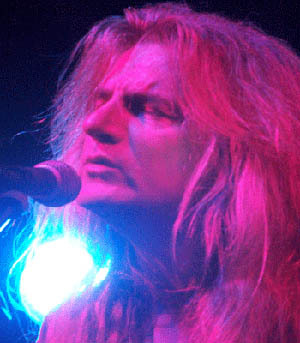 He has worked with the Scorpions, Asia, John Wetton, Uli Jon Roth and many more. Well just finished 2 solo CD's (both instrumental) one is smooth jazz based mostly around jazz piano (rhodes) type sounds and the other is an Indian vocal CD where I took samples of Indian vocals and put my own music underneath the voices. I'm also composing songs for the first studio CD of the John Young Band. Touring wise I've just got back from working with Scorpions again and the Pyramids show was a real blast. I have a 13 date solo tour of Germany and Switzerland pencilled in for late March early April and I'm sure many other shows will start to appear over the coming weeks as we gradually get the festivities out of the way. 2. Bonnie Tyler - You�ve been a mainstay of her band for awhile now. How did you get the gig and what have been the highlights so far? I wasn't really the first choice for BT and about 10 players went for the gig. I found that some of the Steinman stuff was quite difficult and in order to learn Faster than the Speed of night properly (and keep it in time) I learnt the riff with both hands. This impressed the band and I think it sealed the deal...so in a way I was quite lucky. I got on great with BT and the band and we've been together now for about 12 years. Highlights have been many from 5 weeks in Barbados (with just 4 shows) to the DonauFest where we were headlining and played to over 150,000 people. It's always good fun and after all these years a bit like working with your family! 3. How do you view the current music scene? Has the evolution of downloading and the wide use of the Internet helped spread the word more about your music? I think Music is going through a crisis at the moment and I don't think downloads are harming the business ...quite the reverse. The one thing that worries me slightly is the lack of respect for our art at all levels. I have a friend who's an artist and as such his prints sell for 3-500 pounds a time. Sadly music on the other hand has become a throwaway culture and although downloads don't help it's not their fault. The music business is one of the few industries where you do not need to know anything about the product 'music' to be involved. If you went for a heart operation and a young 16 year old girl came in and declared she was going to do the operation although she knew nothing about surgery but of course she was a good dancer...you'd feel a mite worried methinks. This of course doesn't happen so why do we let it happen in music. Fashion has nothing to do with real music...music is an aural experience ...something that should feel wonderful with your eyes either open or closed!. As such record companies, radio , TV etc are not helping. The problem lies in education we've spent so long in this rut that banality is now the norm as such very few people in a position of power have the ability to tell the difference between pointless rubbish and the sublime and those that do are to too quick to hide their real thoughts in favour of the company line. So we are left with people looking for quick short term fixes in a world desperate for someone to plant the seeds for the long term with beautiful music and poignant lyrics.I think it's doubtful that this will come from the regular pop diva's and as such this is where the download can score. The industry probably gives us about 20% of what's out there ...but it tells us it's 100% and many folk believe this.Where hope springs eternal is when someone actively seeks out new music and this can generally be found through websites and downloading and as a result this can (over time ) change things. It was lovely to see so many young people at the recent Focus shows (now they are sublime and should be on everyone's learning curriculum!) and I'm sure the internet had it's part to play in this. As I said some time ago we need a website that can tell us all about the things we don't know we are looking for:-))))) sorry for the long winded answer! 4. Greenslade are back on the road. Are there any plans for a new album and how was the live set released on Angel Air received? The live CD I thought worked really well and as such is a bit of a hidden gem. I think it was probably hampered by the previous CD Large Afternoon which to be honest I felt was rushed and didn't show the band in it's true light espcially as a drum machine was used which for me went against the grain of the band. 5. Which of your songs(s) recorded by other artists are you most proud of and why? That's a good question . I think Crime of Passion by John Wetton from the Battlelines CD would have to be my favourite to date. I was always a big fan of John's work long before I worked with him and to be on that CD in such exalted songwriting company was a great honour. John also did a great job and I think that album should be up there with all the great Asia CD's and had it not been for various record company upheavals I think it may well have acheived that. 6. What have been the most memorable gigs and why? That's a harder question. Things change over the years...my first ever gig took a year to prepare for (at a pub in Liverpool) and was pretty awful but it was a milestone. I guess from there the old gigs at the Moonstone in Liverpool with the jazz rock band England's National Sport. Uli Jon Roth Hammersmith Odeon and Milwaukee Summerfest. Roy Wood big band NEC (with George Harrison et al). The fact that Cathedral never did a gig! (What a waste!). The Far East tour and the Pyramids with The Scorpions and every single gig I've ever done with the JYB!! 8. Message to your fans? ...and for those of you who might wish to join please feel free to visit our downloads in the songs section at www.insignificance.co.uk (we'd love to welcome you aboard.!) spread the word ...love,peace and all the best for 2006.